BMW has unveiled a 39g/km plug-in hybrid X1 which uses a drivetrain derived from the i8 supercar. Long-wheelbase X1 PHEV shows there could be a version for Europe. 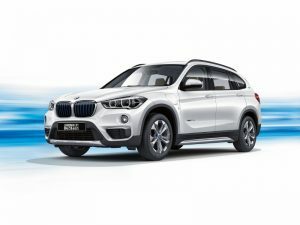 Unveiled at the Chengdu Motor Show, the X1 xDrive25Le iPerformance is based on the long-wheelbase version of the crossover, which is manufactured in China solely for the domestic market. It’s unclear whether a short-wheelbase equivalent will be offered in Europe, though the wider roll-out of BMW’s iPerformance plug-in hybrids and the opportunities of CO2-based taxation in the region suggest this is possible. The technology underneath is shared with the 225xe Active Tourer, and similar to the drivetrain from the i8. It combines a 147bhp 1.5-litre turbocharged petrol engine, powering the front wheels, with a 94bhp electric rear axle. Its 10.7kWh battery is said to take around four hours to charge, and offers a 37-mile range at up to 85mph, and the two power sources can be combined for bursts of acceleration or four-wheel drive traction. Combined fuel economy is 156.9mpg, equating to CO2 emissions of 39g/km.